Michael Thompson "is very excited" to be headed into tomorrow's final round at the McGladrey Classic with a one shot lead over Billy Horschel. After posting one of only three bogey free rounds on Saturday, Michael jumped into the lead with a three under par 67. Michael's rounds of 65-65-67 have him sitting at thirteen under par. 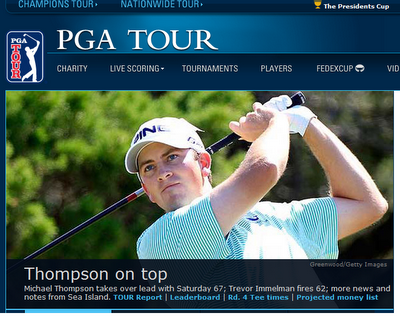 Besides Horschel, Trevor Immelman and Webb Simpson are also within two shots of Micheal's lead. "We had a great time out there; we were talking a lot; we were laughing. It was just like playing at your country club on a Saturday. It really made me feel comfortable going out there and playing with a buddy of mine. We get to do the same thing tomorrow, so in that sense, I know how to think now, in the final group on the weekend, and whether I have the lead or not, it really doesn't matter, I'm just going to go out and play my game and add up the score at the end, and hopefully I'll be the top guy." Being in the final round should garner Michael a lot of television coverage on the Golf Channel, when the McGladrey is on the air which is from 2:00pm-5:00pm ET. As usual, we've got all the links you'll need to follow on-line.